Bereaved Blaze Families Criticize Putin for Not Meeting Them - Integration Through Media ....! (VOA): The families of those who died in a massive shopping mall blaze Sunday in the Siberian city of Kemerovo are criticizing President Vladimir Putin for failing to meet with them when he visited the scene of the fire that left at least 64 dead — 41 of them children. While Putin visited some injured survivors in the hospital, that failed to placate critics. Commentators are branding his visit “cynical,” saying he repeated his mistakes of 18 years ago when he was slow to meet families of sailors who drowned in 2000 when the nuclear submarine the Kursk sank. “The children are dead already, we can't bring them back. But we need clear justice,” said a traumatized father of a child who died in the massive fire that’s shocked Russia. He was speaking to hundreds of protesters, who 48 hours after the blaze had come to mourn their dead collectively — and to call angrily for the city’s mayor and regional leaders to resign.Kemerovo sits in a hardscrabble coal-mining region and is no stranger to unexpected tragedy and loss. This time, though, with many children dead there is no sense of acceptance — tempers are flaring with anger mounting as details emerge about how the emergency exits were blocked or locked, preventing quick flight and obstructing rescue efforts. The alarm system failed to work, as did the facility’s PA system, possibly switched off for reasons unknown by a security guard, say investigators. Mall workers fled as the fire swept through the upper floors of the Winter Cherry shopping mall, leaving behind many children trapped in the center’s cinema complex. President Putin, fresh from re-election, clearly tried get out ahead of the outrage. 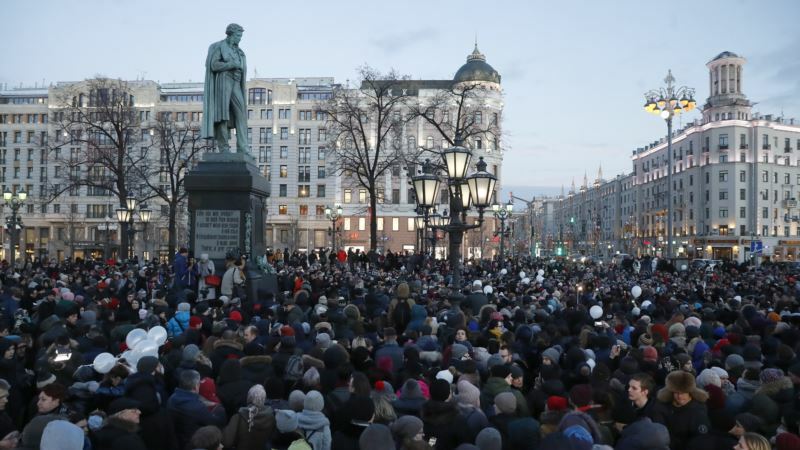 On Tuesday, he arrived in Kemerovo, laid flowers at a makeshift memorial, met with with regional authorities and vowed to get to the bottom of what happened. He denounced carelessness and criminal negligence. Neither President Putin nor Kemerovo’s regional governor, Aman Tuleyev, addressed the crowd. Some analysts compared Putin’s visit to Kemerovo with British Prime Minister Theresa May’s first trip to the scene last year of the Grenfell apartment-block fire in London. Seventy-one people died in that blaze, which has been blamed on the building’s cladding, and May was faulted by the media and lawmakers for avoiding angry family members demanding answers and for spending most of her time with officials and first responders. She went back to the scene several days later in order to placate the families. As with May, so with Putin. “Why are the queen and king safe and sound? Let them come here, get up and answer us,” a protester demanded outside Kemerovo’s regional administration, joining others accusing authorities of obscuring the true scale of the disaster, the deadliest fire in the country since the Soviet era. Additional riot police and National Guardsmen troops were deployed as the protest developed. Locals have also questioned the official death toll announced by local authorities and they claim that more than 400 people may have died in the fire. “How many people actually died, why are you lying to us?” Interfax agency quoted one protester as shouting. Bychkova told VOA there is a sense of deja vu with the visit. In 2000, Putin remained vacationing at his residence in the Back Sea resort of Sochi as the Kursk drama unfolded. The submarine sank in the Barents Sea on the 97th day of his first term in office with 118 seamen on board and he left for his holiday after being assured by navy chiefs a rescue operation was underway and everything was under control. He eventually met the relatives as a media storm erupted — and the meeting did not go well as relatives accused him of inaction and the military of incompetence. Some analysts pinpoint the storm over the Kursk as triggering Putin’s decision to bring the media to heel and to orchestrate a crackdown on independent television channels. Bychkova says Putin’s visit to Kemerovo suggests he didn’t fully learn lessons from the sinking of the Kursk. “No, I do not think so. It does not look like that. To start with, he went to Kemerovo more than 24 hours late. Nearly two days have passed since the time all that happened. That is actually a long time! Because already on Sunday night, Moscow time it became clear that something very serious and very scary had happened,” she said.